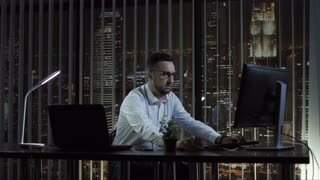 Search Results for "office dance"
Casual man in office starting to dance after receiving wonderful news on laptop in office with coworkers. employee with red long hair using headphones dancing happy smiling looking at the camera front view. portrait young caucasian woman sitting at the workplace in modern office. 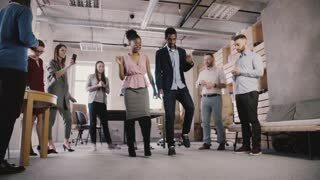 Multiethnic business people celebrate business achievement at casual office dance party in modern coworking slow motion. Happy African American woman dancing at office party. Multiethnic colleagues dance, share fun bonding time together 4K. 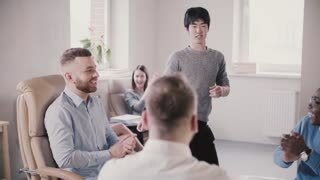 Happy Japanese office worker doing very funny victory dance walk in modern loft office celebrating success slow motion. 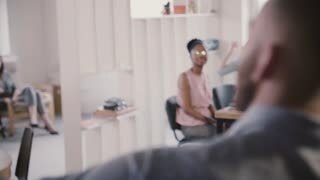 Camera follows African American man enter office doing joyful dance of success, high-fiving multi-ethnic colleagues 4K. Camera follows happy European businesswoman enter modern office doing victory dance walk of celebration slow motion. 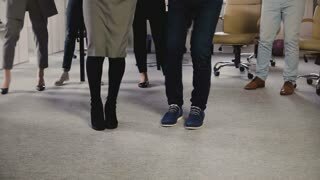 Camera follows Caucasian businesswoman enter multi-ethnic office doing funny dance walk of success and celebration 4K. 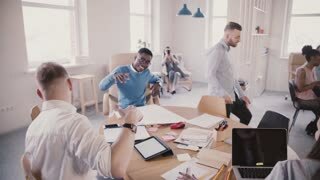 Happy excited businessman walks into modern office doing funny celebration dance, multi-ethnic workers clap slow motion. 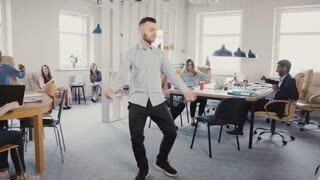 Happy businessman walking through the modern office and doing crazy dance. Man in cheerful mood greets with colleagues. Two African American colleagues doing fun dance at office party. Mixed race friends having fun activity at workplace 4K. Attractive young girl dancing at an office party. Slow motion close up. Mixed race holiday celebration. Festive emotion. 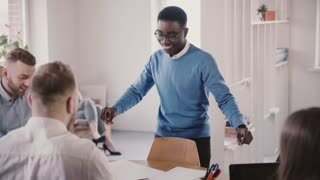 Happy African American employee doing funny winner dance in modern office, gives high-five to colleague slow motion. 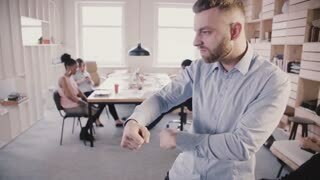 Excited young happy Caucasian businessman celebrating success with fun silly dance in modern healthy office slow motion. 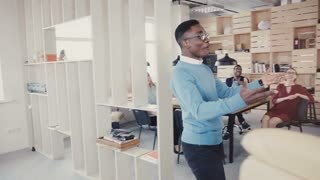 Happy African American man gives high fives to office colleagues. Celebrating business success with joyful dance 4K. 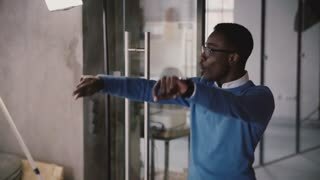 Excited African American businessman celebrates victory with funny dance. 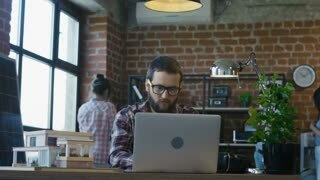 Successful boss in modern office slow motion. 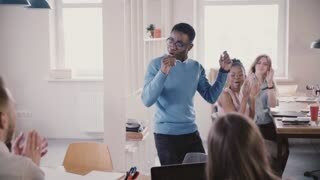 Young successful businessman doing victory dance in modern light multi-ethnic office, people clapping and laughing 4K. Successful young businessman celebrating achievement with crazy dance walk. 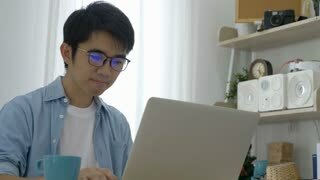 Happy handsome male CEO in modern office 4K.